States › Manipur › How to Reach Manipur by Train? How to Reach Manipur by Train? Despite being one of the most frequented tourist destinations in North East India, the state of Manipur boasts a decent connectivity with Indian Railway. In fact, there is no direct train service to Manipur. However, tourists still considered railway as one of the significant means of reaching Manipur. 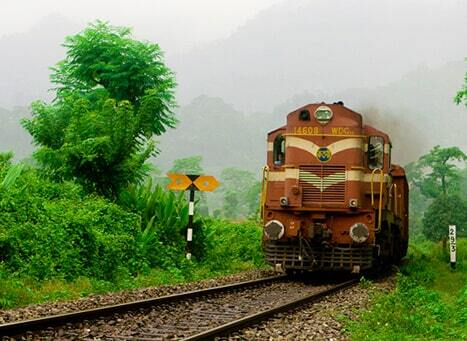 The nearest railway station from Imphal, Manipur, is Dimapur in Nagaland, which is located at a distance of 201 km. From Dimapur, daily regular buses ply via National Highway 39 that take tourists to Imphal. The entire journey from the railway station to Imphal take some 7-8 hours to complete. Coming onto the Dimapur station, the railhead is very-well connected with almost all the regions of the country. For tourists coming from northern India, Dimapur offers a great transit facility to various cities; trains like Avadh Assam Express, Brahmaputra Mail, New Delhi Dibrugarh Town Rajdhani Express, Chandigarh Dibrugarh Express and Amritsar Dibrugarh Weekly Express connects Dimapur with some popular northern cities like Delhi, Chandigarh, Amritsar and Agra. Similarly, in the eastern region, trains like New Delhi Dibrugarh Town Rajdhani Express, Avadh Assam Express, Brahmaputra Mail, Kamrup Express, KSR Bengaluru New Tinsukia Weekly Express, Kanyakumari Dibrugarh Vivek Express and Tambaram Dibrugarh Express arrive and depart from Patna, Bhubaneswar and Kolkata. Whereas for the southern region, trains like KSR Bengaluru New Tinsukia Weekly SF Express from Chennai, Kochi and Bengaluru and Kanyakumari Dibrugarh Vivek Express from Thiruvananthapuram gives you the access to reach Manipur. From the western region of India, there is hardly any train ply to Dimapur. So, it would be ideal if you board a train to Dimapur from any of the above-mentioned destinations. Since railway offers a number of options to reach Dimapur, thus, despite being not so ideal, the railway is a prefered mean of travelling for tourists from east, south and north India.